10 Tins of 10 cigars. Macanudo Maduro cigars offer all the richness of the fullest-flavored Connecticut Broadleaf wrappers and all the smoothness that you expect from this leading premium cigar brand. Crafted in the Dominican Republic using the very best of Broadleaf wrappers from the Connecticut River Valley, Macanudo Maduro cigars are creamy and slightly sweet with mellow-to-medium strength and gentle notes of cocoa, cedar, and spice. Macanudo Ascot Maduro delivers its warm and welcoming maduro character in an expertly crafted 4 3/8 x 32 cigarillo. Good flavor. Very prompt delivery. The suction is not quite well. Could be just not the best batch. I've been buying these tins for years, and I'm always happy with the quality. Excellent and strong cigars, that pack a punch for their small size. All the Macanudo Maduros have been satisfying. Great while on the go! These cigars are perfect to take along with you everywhere while on the go and especially when you need a quick cigar fix with all the fine quality ingredients. I wanted an alternative to always having to take an hour to enjoy a smoke so I tried these. They are very flavorful and actually last longer than you’d think. Love them! Great daily cigar. Strong and smooth and consistent. I've smoked over 1000 of these, and still going strong. 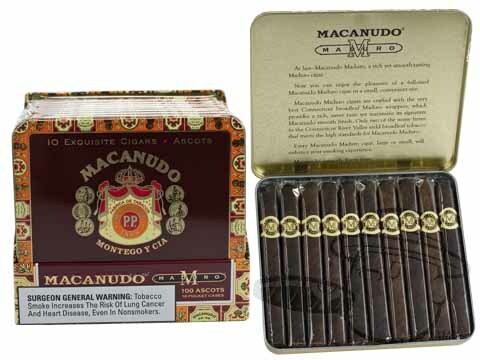 Macanudo Ascot Maduro is rated 4.6 out of 5 based on 11 customer ratings.